From the Hancock County Court House, go 2.6 miles northeast on Hwy 22/15 to the split and then go right on Hwy 22 for another 13.4 miles to Taliaferro County Rd 33 on the left (County Rd 33 is 2 miles past the Hancock-Taliaferro line). Follow County Rd 33 for 0.7 mile to County Rd 29 (Marshall Jones Rd) on the left. Follow County Rd 29 (Marshall Jones Rd) for 1.1 miles to County Rd 28. Turn left and follow Country Rd 28 for 0.2 mile. On the right is a logging road. Turn right on the logging road and go 0.2 mile to another logging road on your left. Turn left and follow this logging road for 0.3 mile. Walk into the woods on your left for 230 feet. The walled cemetery is on a slight rise. A shorter route is to follow County Rd. 28 from nearer the Hancock-Taliaferro line, but County Rd. 28 can be muddy and may not be passable at all times. 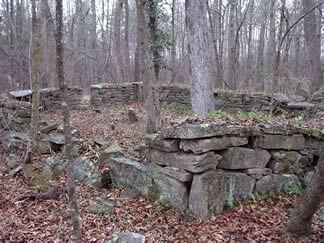 Part of this cemetery is surrounded by a stone wall, approximately 50 feet by 30 feet. 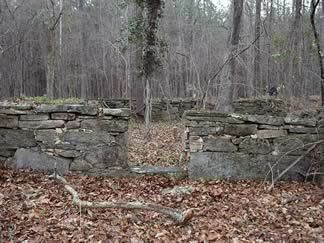 We include the cemetery in the Hancock County website because, prior to 1830, this area was part of Hancock County. Name and information on this cemetery was provided by Ed D. Rudisill of Mableton, Ga. Many graves (25-50) lie outside the stone wall of the cemetery.